Sycamore cabin is the perfect getaway. It's accessible by road, surrounded by trees, and features a small spring fed brook. The kitchen, living room, bedroom, and bath are all on one floor, the second sleeping area is a loft and is accessible by ladder. Sycamore cabin has one bedroom with a queen bed and the loft features a full size mattress. The futon in the living room also lays down into a full sized sleeping space. The maximum occupancy is 6 adults. The kitchen has a built in eating area which features a concrete countertop with embedded quartzite we harvested from the stream that runs alongside the cabin. There is a four burner stovetop, a dorm sized refrigerator, toaster, coffee pot and the cookware and dishes are provided. There is a handcrafted custom bench and stools for the eating nook. The bathroom has a sink, toilet and shower, which feature locally harvested, and aromatic red cedar. The cabin has a propane wall heater for the winter and air conditioning for the summer. Sycamore cabin is located alongside Route 77 (Nada Tunnel Rd.) in the Red River Gorge Geological Area, and is perfect for a family, group, or couples' getaway. Relax right in the heart of the Red River Gorge and step out the door onto miles of trails with spectacular views. 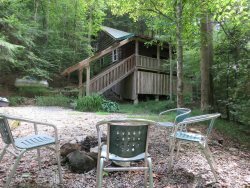 Sycamore cabin has immediate access to the "Rough Trail" as well as the trail to Gray's Arch from the Martin’s Fork parking lot. Kitchen: Full kitchen furnished with a gas stove, toaster oven, double sink, compact refrigerator and coffee pot. Cookware, dishware, soap and cleaning linens are also provided. Living/Dining: The main room has a countertop dining nook fit for 6 and a full futon couch. Bathroom: Full bath includes sink, toilet, and tub shower. Bedroom: Sycamore has a queen bed in the main bedroom, and a full size mattress in the loft upstairs. Pillows provided. Additional Amenities: Weber charcoal grill, wall heater, window AC and ceiling fan, porch swing, TV (DVD only) and private fire pit.